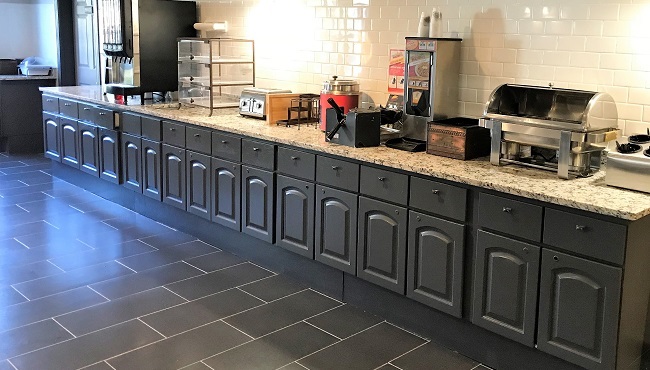 While at the Country Inn & Suites in Zion, IL, you can refuel each morning with the hotel’s free, hot breakfast. Sit down to a plate of scrambled eggs, a golden waffle and fresh fruit, or grab a bagel and a cup of coffee for a quick meal on the go. For lunch and dinner, head to nearby restaurants like Stone Creek Grill, El Lago or N&T’s, which serves American and Thai cuisine. Breakfast. It's the most important meal of the day, which is why we offer a variety of delicious breakfast options, so you can rest assured you'll always have a good morning at Country Inn & Suites® by Radisson. And as always, it's on us. *Hot items vary daily, with two items offered each morning. Mon-Fri, 6:00 a.m. - 9:30 a.m.
Sat-Sun and holidays, 7:00 a.m. - 10:30 a.m.